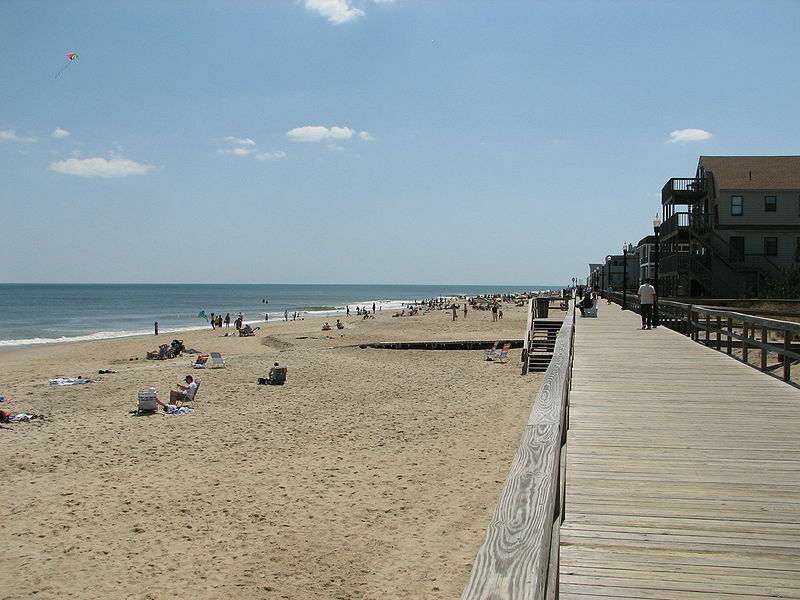 Bethany Beach is a small, family-friendly beach town that provides easy access to Delmarva's big attractions. Bethany Beach is a small, family-friendly beach town that provides easy access to Delmarva's big attractions. Picture your summer vacation at a popular northeast beach town – crowded beaches, tacky T-shirt shops and of course, droves of loud college kids who can turn a family evening on the boardwalk into an awkward outing for both you and your youngsters. Sound familiar? One of the biggest mistakes we can make when choosing a summer beach getaway for our family is convincing ourselves that we need to be at a big beach town to have fun. It is often better to fall asleep to the sounds of the ocean rather than the boardwalk's fun park. Why not head to a rustic and local favorite town for a beach getaway instead of sitting in traffic for another non-distinct seafood buffet? To do our kind of family vacation, consider visiting Delaware’s “quiet resort,” Bethany Beach, Delaware, where kids from tots to teens can have a blast. Conveniently located just 15 miles north of Ocean City, Maryland and 13 miles south of Rehoboth Beach, Delaware, Bethany Beach has become a great getaway for families who are looking to taste the excitement of a popular summer destination but who also desire the comfort of a charming and low-key beach town. This seaside resort is bordered to the east by 1.5 miles of free beaches that are great for children of all ages. The coasts here are cleaner than most and lend themselves to all kinds of fun aquatic recreation. Surf fishing, kites and surfing are all permitted before and after lifeguard hours while boogie boarding, body surfing, and sandcastle-building are permitted from sunup to sundown. In addition to the extra elbow room, the abundance of lifeguards, occasional tidal pools and large rental umbrellas available at every beach entrance all make Bethany Beach a great destination for a family beach getaway. Even those traveling with babies and toddlers will be able to relax while the little ones are busy splashing and digging in the soft sand. Garfield Parkway in downtown Bethany provides a collection of quaint storefronts and restaurants that are sure to delight. After picking up your morning paper at the vintage Five-and-Dime, be sure to grab coffee and a tasty doughnut at the Bethany Bakery. As you walk up Garfield Parkway towards the beach, you will see the Bethany Boardwalk. This half-mile stretch is perfect for an after-dinner family stroll with an ice-cream cone from Dickey’s Frozen Custard. The Bethany Boardwalk Bandstand hosts live concerts every Friday through Sunday at 7:30 from Memorial Day until Labor Day. After grabbing a bucket of Fisher’s famous caramel popcorn, find a bench near the bandstand and enjoy the best tribute and original acts the region has to offer. A complete bandstand lineup can be found by visiting the Town of Bethany Beach online. 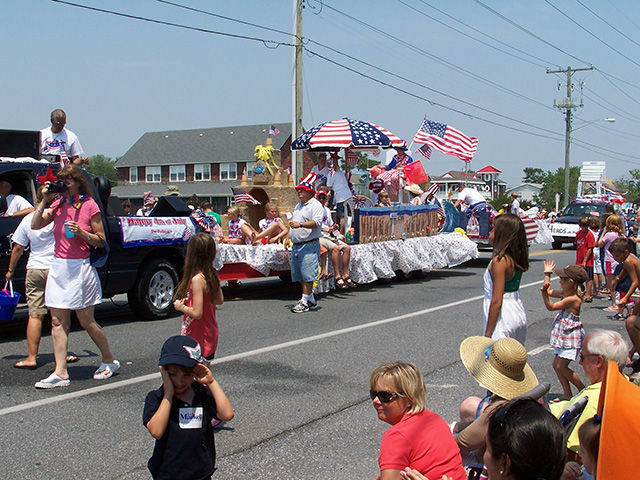 Since 1983, the town of Bethany Beach has hosted one of Delaware’s largest Fourth of July celebrations. Every year thousands of residents and visitors line the streets of Bethany for the annual Fourth of July Parade which consists of fun floats, local marching bands, and hundreds of bicyclists all decorated in red, white, and blue. This patriotic procession is open to everyone and assembles at St. Anne’s Church and Christian Center. (Note, if the Fourth of July falls on a Sunday, St. Anne’s Church requests that the parade be held on Monday, July 5). 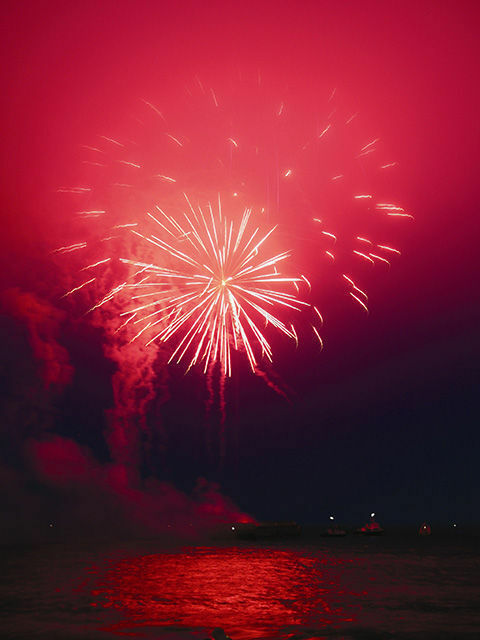 At nightfall, after a performance on the boardwalk’s bandstand, families and friends assemble along Bethany’s beautiful moonlit beaches for a spectacular Independence Day fireworks display over the ocean. Spots on the beach fill up quickly so arrive early. Don’t forget to bring your beach chairs and a box of sparklers for the kids! For the requisite (but small) dose of noisy, energetic boardwalks and popular seaside strips, all you have to do is drive 20 minutes north or south along the coast. To the south, you will find the tall high rises and bright lights of Ocean City, Maryland. For a comprehensive listing of things to do in Ocean City, Maryland, check out Family Travel Forum’s Ocean City Attractions Guide. A 20-minute ride up the Atlantic coast will land you in Rehoboth Beach, Delaware. While certainly bigger and more active than Bethany Beach, Rehoboth still possesses a mellow, family-friendly atmosphere. With fun rides, games, shops and restaurants, a stroll along Rehoboth’s boardwalk is a great evening activity for families staying in nearby Bethany Beach. For more information, check out Family Travel Forum’s Rehoboth Beach Feature Story. Hungry families will enjoy Bethany Blues BBQ where everyone can fill up on authentic wood smoked BBQ and fixings. Meals range from $10 to $25 and a carryout service is available. This Seaside BBQ joint is finger lickin' fun for the whole family. Bethany Blues is located at 6 North Pennsylvania Avenue in downtown Bethany. For more information call 302/537-1500. Don’t forget that Bethany Beach is in the heart of crab country. For steamed crabs and crab cakes, we recommend Mickey’s Family Crab House. This fun, casual family restaurant has been offering great local seafood and all-you-can-eat crabs for over 20 years. Mickey’s Family Crab House is located approximately one mile south of downtown Bethany Beach on Jefferson Bridge Road. Much of where you stay in Bethany Beach depends on the size of your party and the length of your visit. If you are visiting with multiple families or generations, or you are staying for more than four days, you should give strong consideration to a rental property. Unlike a hotel room, your rental property will provide adequate living space for everyone, a kitchen for those nights you decide to eat in, and some unique personality that will certainly add to your stay in Bethany. Hotels in Bethany typically appeal to those traveling in small numbers for shorter periods of time. Although space is limited and you will not have access to a kitchen, your room will be cleaned daily by the hotel staff. A vacuumed carpet and fresh change of sheets can make a huge difference when you’ve been tracking sand in and out of your room all day. Most hotels also provide a swimming pool which makes for a refreshing family pit stop between the beach and your room. The Holiday Inn Express South Bethany (302/541-9200) is less than a mile from the attractions of Downtown Bethany and only a 2-minute walk from the beach. In the peak of summer, rooms go for about $$$ for a family of four. For more information on hotels in Bethany, see Popular Hotels in Bethany Beach.